Stage a face-off between The Joker™ and Batman™ at the Gotham City Energy Facility in The LEGO® Batman Movie: The Joker Balloon Escape set, featuring The Joker's detachable balloon backpack and a power plant build. The power plant has a movable bomb element and silo with explode function, while Batman is armed with a grappling gun to intensify role-play battles. Includes two minifigures. 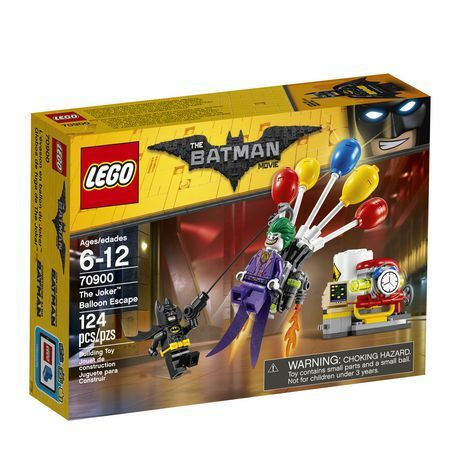 The LEGO Batman Movie - The Joker™ Balloon Escape (70900) Features: The Joker's balloon backpack features five balloon and two translucent flame elements. The power plant features a silo with explode function, pipes, plus computer, pressure meter and bomb elements. Weapons include Batman's grappling gun with string attached. Accessory elements include Batman's cape and new-for-spring-2017 molded utility belt, and The Joker's special purple coat-tail. Balloon backpack measures over 4 inch (11 centimeter) high, 3 inch (9 centimeter) wide and 1 inch (4 centimeter) deep. DC Comics is one of the largest American companies in comic books and related media publishing. A subsidiary of Time Warner, DC is responsible for such famous characters as Superman, Batman, Wonder Woman, Green Lantern, The Flash, Aquaman, Hawkman and Green Arrow. The initials DC were originally an abbreviation for Detective Comics, and later the official name. Publishing thousands of comic books, graphic novels and magazines each year, DC Entertainment is the largest English-language publisher of comics in the world. Pick your favorite character or collect them all right at Toys R Us!.